Here’s a tongue-in-cheek app that aims to put a smile on your face each day of your pregnancy. 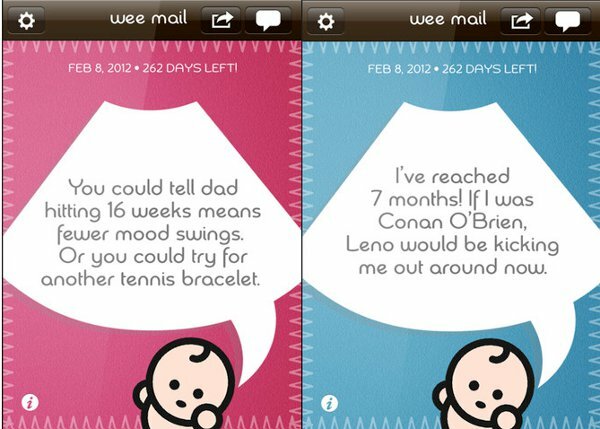 The Wee Mail app gives your unborn child a voice, albeit a rather funny one, through the magic of a iPhone or iPad. Admittedly this app works best if your sense of humour is a little left of centre. Once you download the free app, you enter your baby’s due date and, if you know it, name and gender. Then, coinciding with pregnancy milestones, a flurry of messages from the “inside” will follow. Take a look at the video below to see how it works. All mothers have pondered just what our future children will be like once they’re born, the Wee Mail app gives a fictitious insight into those little minds. Download it for free from iTunes.